A powerful drama examining the culpability of German society in enabling the extremism of Hitler's Nazis, Judgment At Nuremberg is thought-provoking filmmaking at its best. A star-studded cast glows as a courtroom confrontation sheds light on the insidious rise of evil. It's 1948, and Judge Dan Haywood (Spencer Tracy) has been recruited out of retirement in the state of Maine to preside over an American-administered post-war trial in Nuremberg, Germany. The defendants are four German civilian judges accused of crimes against the population before and during the war. By not taking a stand against the Nazi laws discriminating according to race and mental competency, the judges are accused of enabling suffering, sterilization, and death. The most prominent of the defendants is Dr. Ernst Janning (Burt Lancaster), an internationally renowned intellectual and published author on the topic of justice, with an impeccable pre-war reputation. Janning refuses to acknowledge the authority of the court and maintains a stony silence as the trial starts, not wanting to legitimize a trial of German citizens presided over by Americans on German soil. The other defendants are less prestigious, and perhaps more susceptible due to less than pristine pasts. The American prosecutor Colonel Tad Lawson (Richard Widmark) is committed and confrontational. A veteran of the war and several prior court cases, he mounts an aggressive attack on the acquiescence of the judges. By applying and upholding the Nazi laws, the judges normalized state brutality, and Lawson draws a direct link to the resultant mass atrocities at the death camps. In addition to presenting stacks of documents as evidence, Lawson humanizes the victims and calls to the witness stand two civilian casualties of the Nazi laws: Rudolph Peterson (Montgomery Clift) was accused of being mentally incompetent and suffered accordingly, while in an infamous case, Irene Wallner (Judy Garland) was accused of having sexual relations with a Jew named Feldenstein. Tasked with the unenviable duty of mounting a defence is young German lawyer Hans Rolfe (Maximilian Schell). He adopts the stance that society as a whole cannot be found guilty of following the laws imposed by fanatical rulers. Rolfe holds his ground against Lawson's ferocious legal arguments, deflecting a succession of accusations and emphasizing that the defendants were fulfilling their civic duties in applying the laws of the land. With the courtroom frequently the scene of heated exchanges between Lawson and Rolfe, Haywood struggles to determine how justice can best be served. With the Berlin blockade revealing the belligerent Soviets as much more of a relevant threat than the defeated Germans, Haywood's task is not made any easier when he meets and starts to socialize with Frau Bertholt (Marlene Dietrich), the widow of a German military commander. 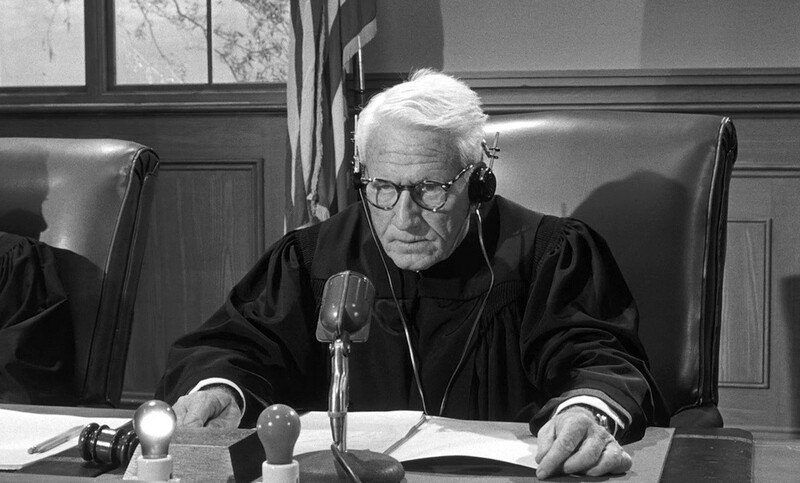 Inspired by actual post-war trials, Judgment At Nuremberg is a rollercoaster ride through the evolution of societal forces. Written by Abby Mann, the script maintains an exquisite balancing act as the prosecution and defence take turns to make their case, every thrust parried with a counter-thrust, the moral pendulum swinging from one side to the other. With Tracy providing sage oversight, Widmark and Schell are well matched and both demonstrate vehement intensity as the legal battle unfolds. 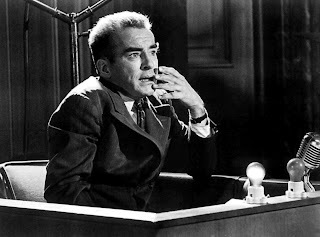 But Schell adds a sublime layer of fragile humanity to the role of Hans Rolfe, an intelligent man fully aware that he is representing losers in the courtroom of the victors, yet determined that the German people not be uniformly indicted for the actions of their leaders. Unexpectedly rising to the top of a stellar cast, Schell won the Best Actor Academy Award. Judy Garland, in her first major film role since 1954's A Star Is Born, and Montgomery Clift add a large curiosity factor to the film. Both battling personal substance abuse demons and barely able to perform, they nevertheless pull out affecting performances as tormented and damaged victims coming back to confront the men who judged them. They both deservedly received Supporting Actor nominations. 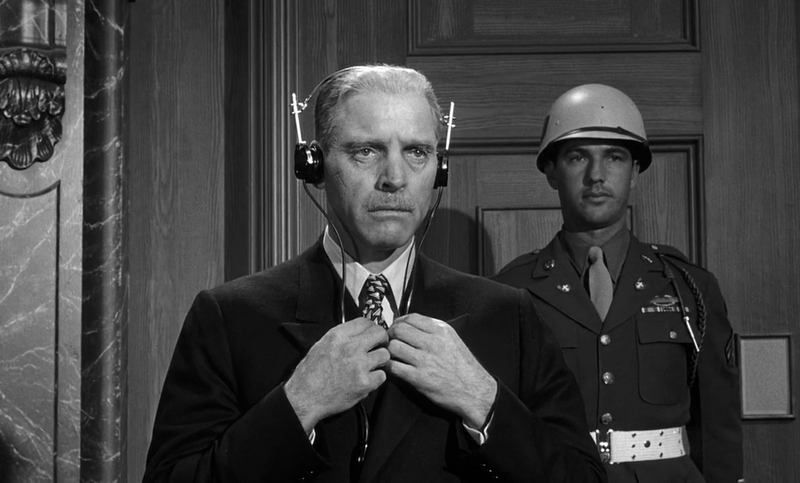 Director Stanley Kramer's cameras find plenty of energy in the grand Nuremberg courtroom. Frequently the cameras maintain fluid motion centred on the witness chair, and end their movement by unexpectedly capturing witness and defendant in the same frame, the accuser and accused caught within the same box. Kramer also elegantly resolves the obstacle of simultaneous courtroom translation without ignoring its reality. Outside the court, Nuremberg is a dichotomy of destruction and rebirth, entire city blocks reduced to rubble by Allied bombing, but some neighbourhoods, markets and restaurants now thriving again mostly on American money. Haywood finds the locals mostly differential to their American vanquishers, and struggling with deep feelings of humiliation and confusion over a dream of restoring nationalistic self-belief turned into a nightmare of devastation. Dr. Janning finally breaks his silence and eloquently yet emotionally outlines how individual responsibility can be subjugated by the rising tide of immense pride fuelled by intoxicating power. 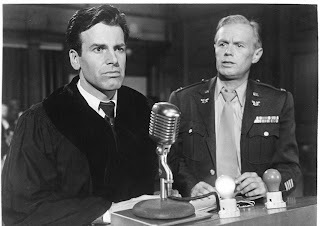 Judgment At Nuremberg asks all the difficult questions, offers no easy answers, and delivers poignant commentary on the dilemmas inherent in a society drifting towards extremism in the name of national reawakening.